Today promises to be the first day of the year that might actually feel like summer. With temperatures predicted to get into the 80s for the first time this year, you will probably see the loon on the nest with its beak open much more than you have seen before. The open beak posture is simply the loon's way of trying to cool off. Much like a dog panting. Loons seem to do much better at handling cool to cold weather than they are at handling hot weather. But once again to day, their first responsibility will be to stay on the eggs and to keep them warm. All the while being ever vigilant and looking around for any sign of danger. Yesterday was an example of that once again. Late in the afternoon I heard a couple of tremolo calls from the nest [remember 'tremolos' are one of the alarm calls for a loon]. When I looked to see what was upsetting the loon, there was nothing in sight that I could see that should cause alarm. Then all of a sudden there came an eagle flying over, relatively low. The eagle had two 'crows in tow' that were attacking it as it flew. And more crows were flying in from all directions to join the chase of the eagle. The crows did not want him around either. But the loon had spotted the eagle when he was still far away and the loon knew that an eagle meant potential trouble for him and the nest. So the tremolo alarm call was given. What is always amazing to me is how the loons can distinguish what is a real threat and what is not a threat. I have seen times when the loons are very upset and I cannot see anything for them to be upset. But then high in the sky I see what is not much more than a black dot. It is an eagle circling so high that it is hard to even distinguish it as an eagle. And yet the loon has recognized it as an eagle and therefore it is a threat. But an osprey can fly over and the loons hardly give it a second glance. For those of you who have not seen one, an osprey is also a bird of prey. It is often called a 'fish hawk' or 'fish eagle'. It looks very much like a bald eagle only a little smaller. 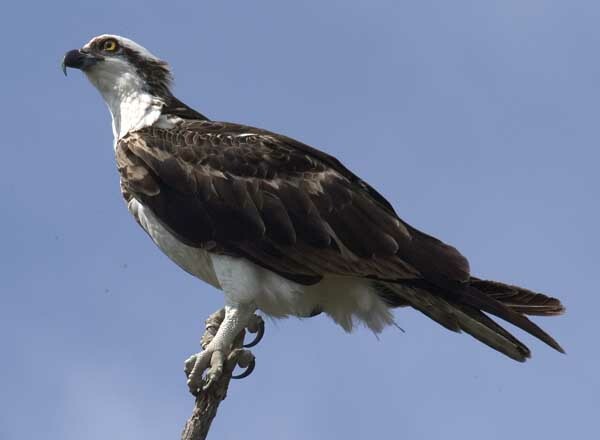 But an osprey feeds almost exclusively on fish. And therefore the eagle knows that it is not a threat. I have trouble distinguishin between a bald eagle and an osprey at a distance. But the loon can do it easily. So the loons will react strongly to the presence of a bald eagle and yet react almost not at all to an osprey. How they can so quickly and easily distinguish between the two is yet one more of the mysteries and miracles of loons. And they are not telling us how they do it. But they clearly know what is a threat and what is not a threat to them. One of the other things that you may want to watch for today are black flies that fly around the head of the loon. They have already been around a few days and with the warmer weather today and tomorrow, I expect that we will see more of them. The black flies are very small so it may be hard to even make them out on the video unless you look very closely. Watch for head movements and the loon rubbing the head against its back as a sign there are black flies there. Or occasionally the loon will 'snap' at things in the air that you may not even be able to see. Maybe tomorrow I will say a few words about the black flies that torment loons. That is yet one more amazing story in itself. But so far today, the loons are enjoying a quiet and uneventful day. And the rest of the day promises the same for our loons. But for the loons, they know that things can change in an instant.